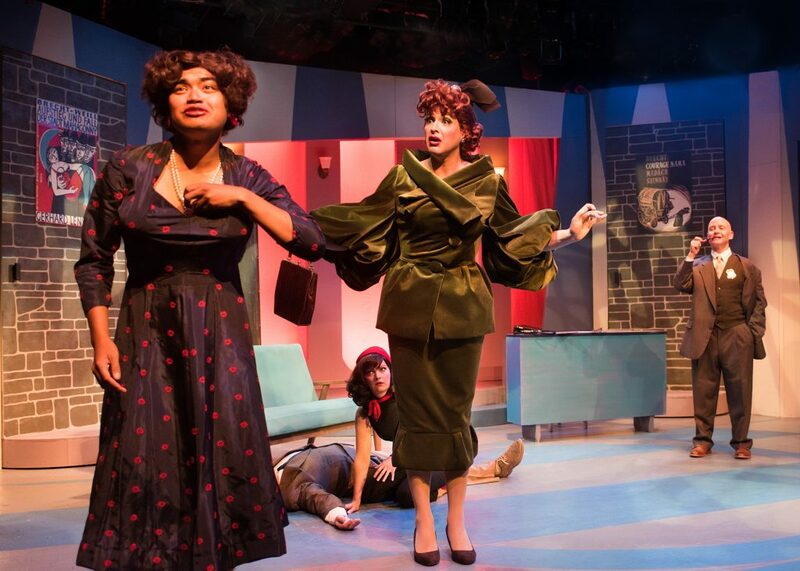 The delightful “Red Scare on Sunset” by Charles Busch features stylish vintage costumes, strong physical acting, and the notorious Hollywood Blacklist. 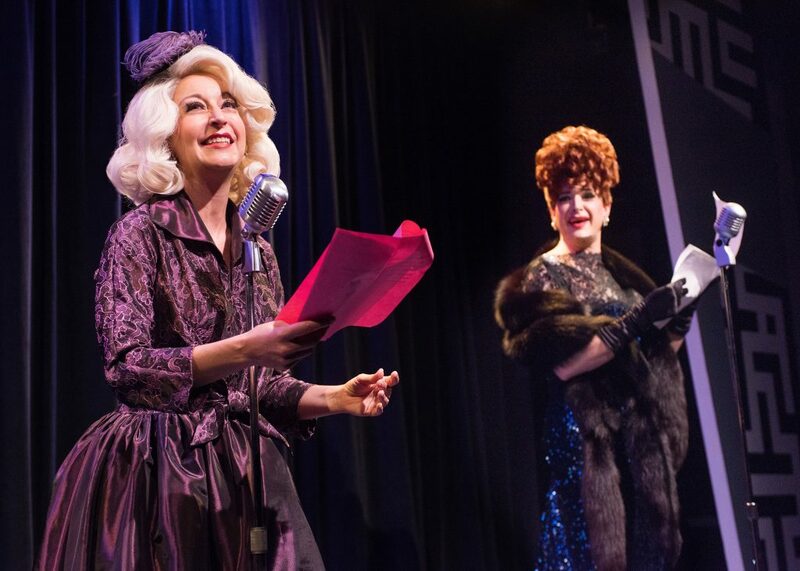 Busch interprets Cold War anti-communist “Red” paranoia as a study in slapstick, using period insults like “Pinko” and “Commie,” in a side-splitting vaudeville style. 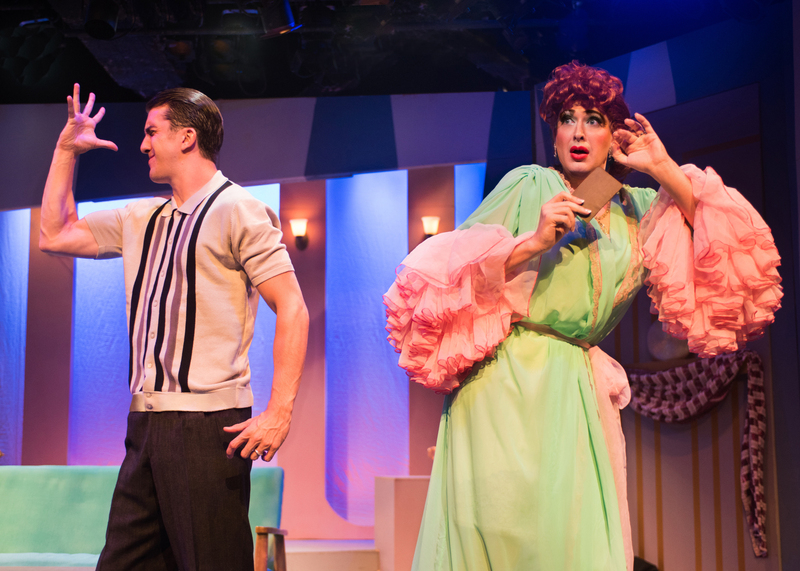 Busch modernizes Old Hollywood with Gay and bawdy humor and witty Chekhov and Stanislavski references. 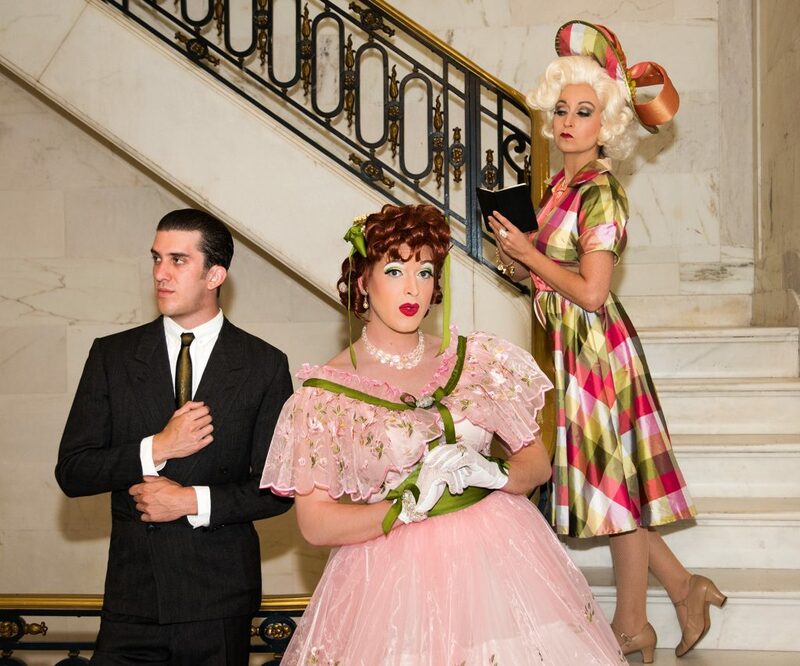 A staple of Busch’s work, the leading lady is played by a Fabulous Drag Queen. We open on a radio show with comedienne who is a staunch, self-proclaimed patriot, Pat Pilford (expressive Nancy French), breaking the fourth wall and denouncing communism. French seamlessly delivers the pretentious Pilford’s tongue in cheek humor. Pat’s dearest friend, elegant movie star Mary Dale (sensational J. Conrad Frank) struts around the stage in lavish jewelry, heels, and gowns designed by Mr. David. Costume Designer Ruby Vixen and Set Designer Kuo-Hao Lo create an authentic 50s Hollywood with swatches of bright pinks, oranges, and greens. In the living room of an extravagant Beverly Hills mansion, the teal couch looks straight out of the 50s, with velvet upholstery and varnished wooden legs. Mary and Pat’s many outfits each have a matching pillbox hat, earrings, necklace, and shoes. We also encounter Mary’s naïve, leftist, and often intoxicated husband Frank Taggart (genuine Kyle Goldman) and his mistress, suspicious actress Marta Towers (feisty Baily Hopkins). They begin an affair at Method Acting class. The Method opposes what Mary represents as a light musical comedy performer and bonafide Hollywood star. Mary is a metaphor for Capitalism, while The Method serves as Soviet Communism, and Frank is caught in the middle unsure. Busch brilliantly uses acting techniques and the inner workings of movie studios to comment on politics. Even Pat Pilford, our original glaring beacon of the American way becomes a pawn in the Russian plot to take over. She is blackmailed by her ex-lover, salacious playwright Mitchell Drake (intense Robert Molossi). Through the twists and turns, Mary Dale never misses a beat. We cannot take our eyes off her whenever she is onstage. Frank’s comedic timing is impeccable. As Mary’s paranoia intensifies, her multitude of exaggerated expressions allow for a thrilling combination of melodrama rooted in honesty. I was also impressed by the doubling of many ensemble roles, notably David Bicha who completely transforms himself from a suspected Communist co-star, to an A-List Hollywood director, to a scene stealing turn as Mary’s grandmother. Baily Hopkins, Joe Wicht, and Robert Molossi taunt Kyle Goldman. “Red Scare” draws striking parallels to today’s questions about personal privacy and the intertwining of politics with the entertainment industry. Pat and Mary’s convictions eerily remind us of our current right-wing regime. At the very least, some of the speeches are quite akin to Trump and his childish tweets. When, engulfed in a red spotlight, Mary maniacally reveals The Blacklist, I feel scared for the future of our country, knowing that there are individuals who do not value diverse perspectives and who let fear and hate rule their hearts. 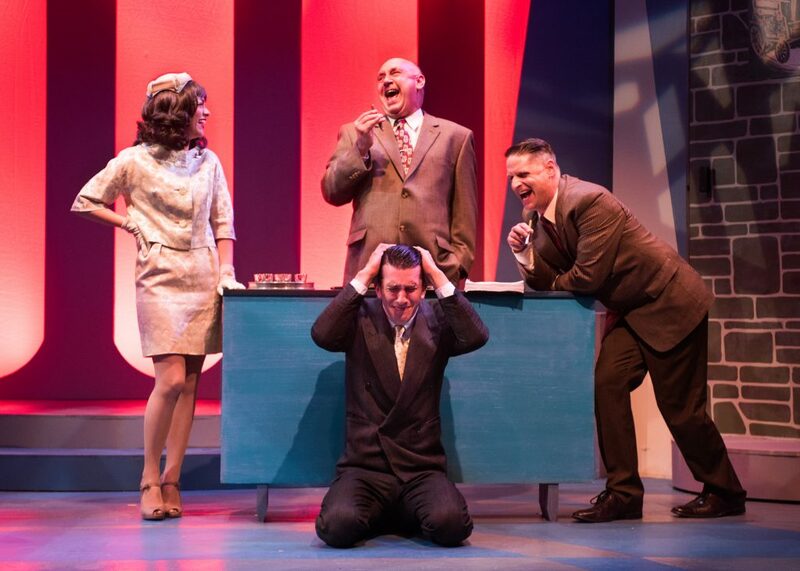 Allen Sawyer’s bold direction compels us to think about the past repeating itself—with nostalgia and sharp satire sharing center stage. Cast: J. Conrad Frank, Nancy French, Bailey Hopkins, David Bicha, Robert Molossi, Kyle Goldman, Joe Wicht, and Kyle Dayrit. Banner photo: Kyle Goldman and J. Conrad Frank.